The NFL Scouting Combine has come and gone, but another big event is now underway. That’s the important period when teams can start signing NFL free agents. As of Monday, there’s a brand new Madden Ultimate Team event which features NFL free agency. It’s going on right now as teams are looking to change up rosters and improve for the season ahead. Here are more details about the new Madden 19 Free Agency event including 30 free agents and two Masters to achieve. There’s been recent signing and trade news or rumors including the big Antonio Brown trade to Oakland, and Carson Wentz joining the Jacksonville Jaguars. However, there are still a number of NFL free agents that are looking to sign with new teams. On Monday morning, the EA Madden Twitch did a special stream for Daily Drops to unveil the Free Agency promotion for Ultimate Team. With the new Madden 19 Free Agency promotion, they’ve unveiled a whopping 30 NFL free agents as cards to begin the event. They include 15 offensive free agents and 15 defensive agents. Among those unveiled for offense are quarterback Ryan Fitzpatrick, halfback Latavius Murray, and tight end Tyler Eifert. For the defense, they’ve got standouts including defensive tackle Malcolm Brown, middle linebacker Manti Te’o, and free safety Jimmie Ward. The two highest-rated cards of the new group so far are RE Ezekiel Ansah and RT Daryl Williams whom each get 95 OVRs. Cornerback Jason Verrett and tight end Tyler Eifert each have 94s, while a trio of players gained 93 OVRs. Those include ROLB Za’Darius Smith, DT Malcolm Brown, and QB Ryan Fitzpatrick. The important thing to note with all of the new free agents’ MUT cards is their Team Chemistry. That won’t update until these players sign with an NFL team. They’ll keep gamers updated through their Twitter account here. Madden Ultimate Team also dropped 20 solo challenges as part of the new event. By completing all of them, gamers will earn 13,000 in coins and 2,650 in Scouts. 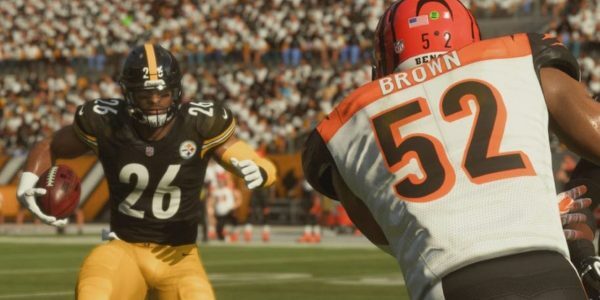 The Madden 19 event will also bring in a new Set goal along with the two high-rated Masters players. In the Scouting Combine promotion, there was a nice Chris Johnson Masters. The newest Masters are definitely major stars too with free agent Le’Veon Bell and Earl Thomas III. Bell sat out this past season in Pittsburgh so he could join a brand new squad in the offseason. Earl Thomas was frustrated with his situation in Seattle but played this past season. Both guys have been a major part of their team’s previous playoff runs and are likely to boost a roster in need of their talents. Here’s a look at the recently-unveiled Le’Veon Bell and Earl Thomas Masters for the Free Agency event. Each player brings a 98 OVR with some impressive attributes to get there. For example, Bell has 98 Agility, 96 Acceleration, and 95 Speed. Thomas boasts 98 Play Recognition, 97 Zone Coverage, 96 Acceleration, and 95 Speed. So how do you score these new Masters? All you need to do is put together a Set of 23x Free Agency player cards. You’ll need five cards rated 92-95, eight cards rated 86-89 OVR, and 10 cards rated at 80-83 OVR. This is repeatable so that you can achieve both Le’Veon Bell and Earl Thomas Masters. Not a bad deal at all for two of the biggest NFL free agents still on the market! Stay tuned for more about this promotion including new releases at VGR’s Madden page.